A rare species of bird discovered. Mom asked us put out a bird feeder a few days ago. We provided an excellent setup: suspended between the house and a grove of trees, positioned just outside the breakfast table window, and rigged with a system of pulleys to easily raise and lower for restocking of seeds. For the first couple days, it did not attract any bird traffic. This morning, everything changed: we were treated to sighting a rare, flightless bird. The black bear; a male juvenile. My dad spotted it first. 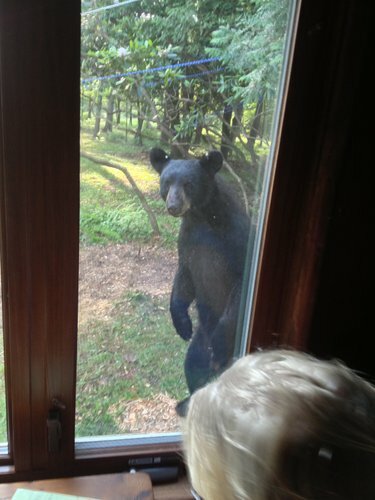 He was grabbing a sugar for his coffee; it took him a while to look up and notice the bear. 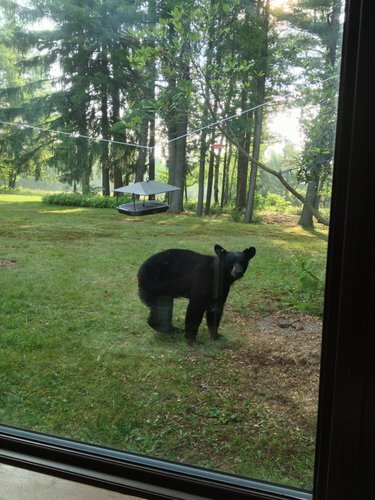 I was roused from bed with calls of "THERE'S A BEAR IN THE BACKYARD," accompanied by frenzied barking from Reka. She has a bark reserved for when she feels really threatened or senses danger: it's throatier, more urgent, and louder. She was using that bark right now. Alfred (I named him Alfred) peeked into the windows, curious what the fuss was all about. After establishing that he was not about to be chased off, Alfred hopped up on his hind legs and took hold of the feeder in his paws, pulling it down to the ground. This one was only a child, but clocked in at around 300 pounds by my estimation. A clawed, heavyweight creature standing up at 7 feet tall is an awesome sight. It's bizarrely human-like in that moment. My dad caught a video of him going to town on the feeder. He would sit on his haunches, sometimes with legs splayed out in front of him, nose burrowed under the little metal roof. Once with a mouthful of seeds, he would draw out his head and munch away, letting his gaze wander. He seemed so at ease, sitting there, utterly unphased by the frantic and aggressive vocalizations from the dog. No amount of shouting, barking, or clapping of pans could deter him. 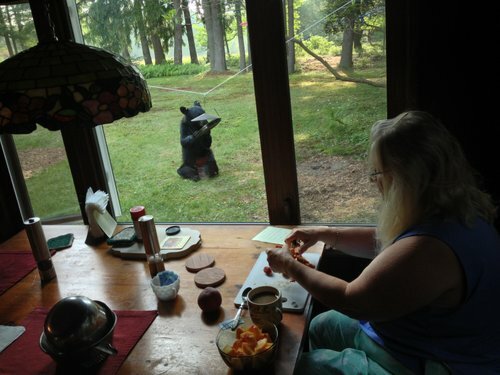 Eventually my mom resigned herself to the gradual dismantling of her beloved bird feeder (which was, by definition, a bear feeder, having never served any birds) and returned to preparing her breakfast. An odd truce was struck between the two breakfasting individuals. All we could do was wait. He left once the feeder was completely emptied. 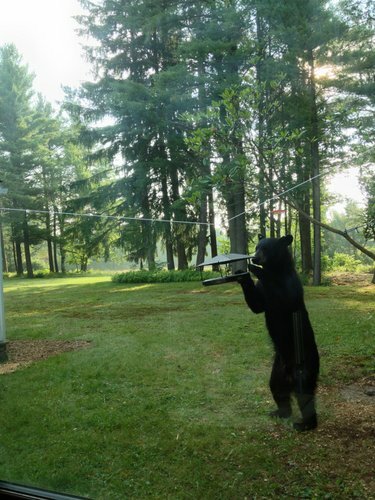 We learned later that everyone at Bear Lake does not bother with a bird feeder while the bears are active. If you put it out, they will figure out a way to knock it down. Put it up a tree? They'll climb it. Up a steel pole? They'll keep slamming it to knock it down. They will dismantle any protection scheme with brute force and patience. The tag on each ear signified two strikes against Alfred; twice already he had run into trouble with the human population. He was a city bear that had been relocated up in the mountains. A third strike and he will be put down. My mom, taking an eventual liking to Alfred, did not file any official complaint. Perhaps hard to believe, but it was my first time seeing a bear at Bear Lake, and certainly the first time being so close to one. Despite the namesake, Bear Lake does not have a particularly high concentration of bear sightings / incidents. Most of the bear population is wild and steers clear of any human areas. Not a bad way to start off the day. On hard work and the decomposition of trees. One of the key aspects of life at Bear Lake is hard work. Perhaps unexpected, given that it's supposed to be a vacation. There is the hard reality of living in a house that sees people 2-3 times per year: there is just a lot of maintenance work to be done. The second is that work is part of feeling fulfilled as human beings. You get hooked on the rewards of manual labor. You get to tangibly improve your living space. See it right there. Falling soundly asleep after a long day of hard work is so satisfying. Today was one of those days. The project: clear the large wood pile currently rotting near the house. The task: move all that wood to a burn pile ~50 yards away using your hands and a small hauler. I started off running solo. 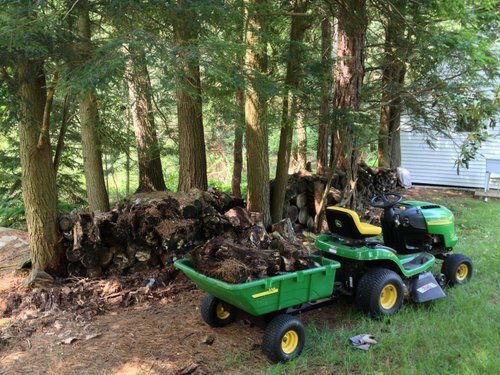 The process: drive tractor up to wood pile, load logs of 10-50 lbs each into trailer with hands, drive to burn pile, unload trailer with hands, repeat. Repeat and repeat and repeat until you're so tired you can't hold a full-fledged thought in your head. Working gloves proved the most critical piece of equipment. 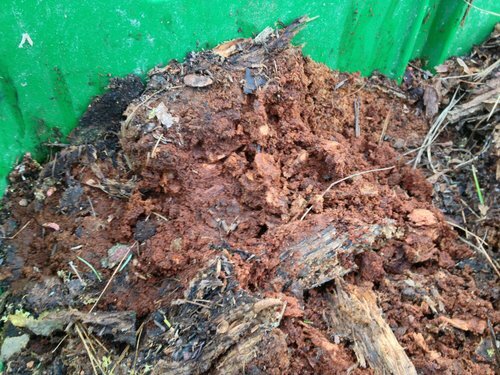 The wood pile varied in stages of decomposition; almost all of them crumbled when grabbed. As my fingers sank repeatedly into mushy, moldy lumber, the only thought on my mind was, "Thank god I'm not actually touching this stuff." I uncovered an ecosystem that exists on decaying trees. Ants build nests underneath the bark in the area hollowed out by termites. Salamanders colored brown with a bright orange streak (blending quite well with rotting wood) patrol the surface in search of the many ants, termites, and other insects that take up residence. Fungi of many different varieties and colors set up shop. Centipedes skitter about, likely on the same mission as the salamanders. In a place of death and decay, there is a remarkable amount of life. 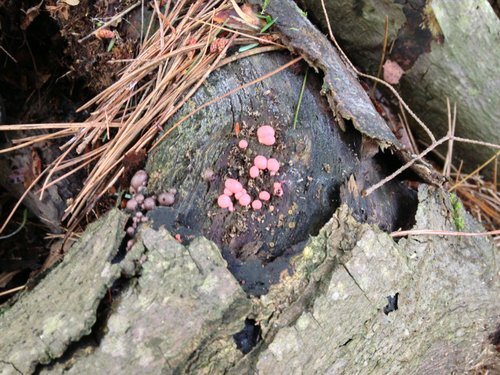 The most notable of the fungi was this collection of pink molds. I took to wearing a ventilation mask on account of the molds. With so much of it probably going airborne as I tossed logs into the trailer, I breathed a little easier knowing none would give me some crazy respiratory symptoms. The heat and humidity was relentless. It isn't nearly as bad up in these wooded lands of the Pocono Mountains, but it gets plenty hot just the same. About an hour into the project, I was thoroughly soaked and peppered with wood scraps. Donned in shorts, sandals, gloves, ventilator mask, and nothing else (except for the sweat glistening on my skin), I was probably a bizarre sight to behold. The lower back aches, even with proper core engagement and lifting technique. My wrists and hands complain about repeatedly grabbing objects at odd angles and hoisting them. Knees and legs begin to tire. It becomes a challenge to keep the inspiration, stoke the fire that drove you to attack the task with such gusto at the beginning. Learning how to keep up with labor over the long haul is a unique challenge. Lunch and an afternoon siesta offers a valuable respite to keep energized. My day was peppered with exciting moments to spice up the day. 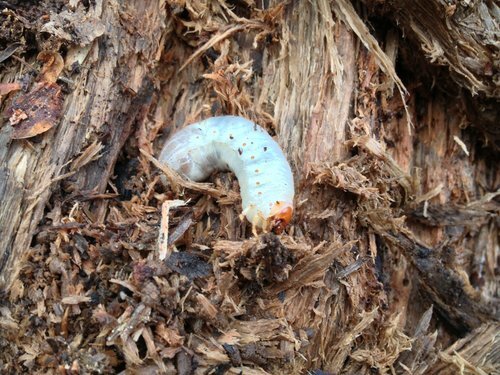 While tossing yet another huge log onto the brush pile, I caught a glimpse of a translucent body partially hidden underneath some rotting wood. Upon further investigation, I revealed the largest grub I have ever seen. It was as big as my thumb. This sucker is the Jabba The Hut of the grub world. I imagine little grublings bringing offerings of chewed wood fiber (or whatever the hell they eat) in exchange for the right to exist on that log. Jabba was quite adept at burrowing. I had to keep coaxing it out with a stick -- no way I was going to touch it with my finger -- for the photo op. It would quickly turn its head down and worm its way through the soft wood, the little mandibles at its mouth constantly working. The body beneath the thin outer skin would slide forward and backward as it worked its way in. I will admit: I did squeal like a little boy when I found it. There was a certain fascination about this gross critter. Intellectually, I know that fallen trees eventually decompose to become part of the forest floor. But there is no substitute for seeing it in action. I was shoveling what amounted to organic mulch. The wood really does turn to dirt. It is SO AMAZING. Its soft, reddish, and moist. After about 5 hours of strenuous work, it was time to call it quits on hauling the wood pile -- because the tractor ran out of gas. But our work was not yet finished. My dad and I broke out the chainsaw to hack up a rather large fallen tree next to the wood pile that also needed to be cleared. More bending over and heavy lifting. Rough, dirty days like these are best concluded by a trip to the lake. Caked with mud, sweat, sunscreen, wood chips, and squashed mosquitoes, there is nothing quite like diving into the pristine waters of the lake. My dad describes it as a "baptismal experience." It is a gratifying moment, washing yourself clean of the day. It is now time to reset, to exit work mode, to sit back and revel in what you've accomplished. Your relaxation is deep, rewarding, and earned. Your muscles ache, but you get to rest -- good job. Forgoing my Ashtanga yoga practice for the day (having concluded that morning practice before breakfast is the most sensible), I am enjoying a calm evening on the porch, writing about the day and sipping at a glass of incredibly delicious whisky brought back from the UK. The porch is screened in, so the cool night air can be experienced without the obligatory swarm of mosquitoes and other insects. Bird calls dominate the auditory landscape while the sun is setting, drowned out occasionally by the rushing of wind through the trees. As night falls, the chirping of crickets and other forest critters take over. Reka, our family dog, barks at who-knows-what from inside, dutifully alerting everyone in the house that, indeed, there are other creatures outside in the darkness. The light fades from the sky, casting trees in negative space. Lightning bugs flash their intermittent, luminescent signals, communicating in some primitive argo. It is only 9:30pm, but I am ready for bed. Tomorrow's sun will bring a new day of hard, rewarding work.